I started this blog way back in the aughts. 2009. TAKEN was one of the first movies I ranked, in February of that year, back when I wasn’t writing an article as much as merely reflecting on the four main scoring categories: Film, Movie, Acting, and Writing. I’d like to think my article writing has gotten more sophisticated in five years, but I’d also like to think that Jennifer Lawrence secretly wants to be with me in an alternate universe. So I’m pretty much delusional. Anyway, it’s good to get back at some of these movies that I’ve considered awhile back but haven’t seen since my blog was in its infancy. I watched TAKEN (2008) on 6.7.14. It was my second viewing of the film, and first since seeing it in theaters back on 2.11.09. Can’t believe this movie is already five and a half years old. Back when I first saw this I wrote: “It’s not one of the all time greats”. Seeing it a second time, it may be necessary to rephrase that. This may not be CITIZEN KANE, but TAKEN needs to be considered in the way that DIE HARD is. Since it’s release in ’09, TAKEN has inspired plenty of copycats. Sure, many of them have starred Liam Neeson too, but it doesn’t negate the larger point. In telling this story of a father Bryan (Neeson) who seeks his kidnapped daughter Kim (Maggie Grace) through Paris, Director Pierre Morel and Writers Luc Besson and Robert Mark Kamen have delivered one of the great action movies of the young 21st century. There is an old adage that an action film is only as good as its villain. We look at classics like DIE HARD and SPEED and consider movies that are better than they should be, like UNDER SIEGE with Tommy Lee Jones, to accentuate this point. TAKEN has no major villain. Surprisingly, it does not need one. Most action films are driven by the hero versus villain trope. Sure a hero may need to save his family, save some hostages, or save the world. But doing so is only a necessary means to get him in the room with the main villain so that they can duke it out. TAKEN goes a different route. Instead, saving his daughter is Bryan’s only care. Normally the kidnapper would somehow be the last guy he confronts. Here, the kidnapper is merely a low rising speed bump in the path of finding his daughter. Create a hero wonderful enough and the villain’s presence is muted. It’s why so many subsequent films were falling over themselves to bring Neeson back in a similar role: TAKEN didn’t need anyone else. 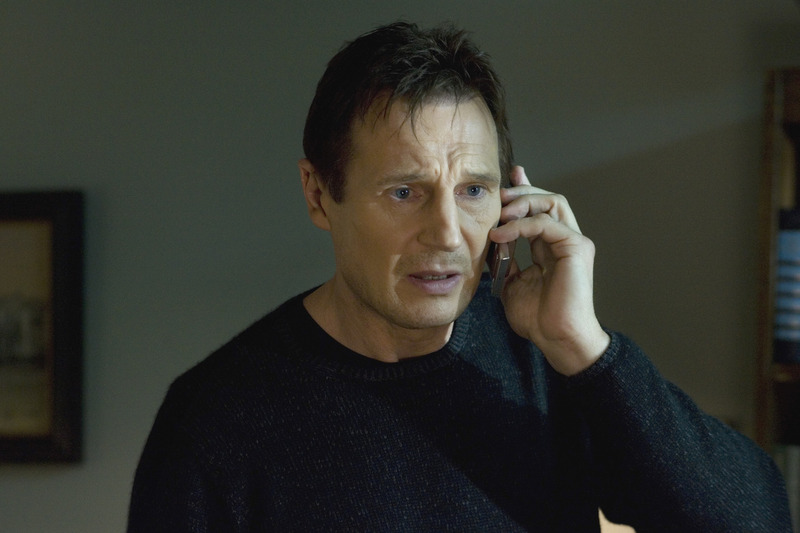 Have Neeson take out nameless and faceless bad guys and you have a movie. These follow-ups have proven it isn’t so easy. The filmmaking team here caught lightning in a bottle with this story and character. Which isn’t to say that the script is perfect. Some of the exposition is clunky and unnecessary. Hearing old war stories didn’t feel organic, and the singer story-line is straight up 90s action-movie convenience. But once Kim arrives in Paris and she meets a guy we know to be bad news, this script flies. It discards unnecessary scenes like where Bryan gets an IV bag and medication and where he leaves a girl he saves. Those are more speed bumps in the way of getting to his daughter. The film flies with a brisk urgency. When Bryan stops for three seconds at an old friend’s for dinner, even if it is all a facade, we feel the minutes ticking away because the story has already told us that he only has so many hours to get to his daughter. That in itself is a device seemingly brought on by arbitrary analysis, but it works here. I’m usually the first one to deride a film for relying on coincidence. TAKEN is filled with it. The entire plot hinges on the fact that this girl’s dad is ex-military and called the fact that she would get into trouble on her Paris trip. And then she does in the first few hours. While she’s on the phone with him. But her step-dad has a private plane to Paris. And the guy who did the scouting the day before is doing it in the same exact place the next day. And the exact right people give the exact right clues without a false lead ever occurring. But what is amazing? It never matters. Not while watching this movie anyway. All of the plot holes and leaps of faith in the world couldn’t derail a movie so wonderful bent on getting to its end. Neeson gives us a hero to remember, and one which rewards multiple viewings. His “particular set of skills” speech gets marked down in the action movie canon. This is a violent and aggressive PG-13 movie. It is a movie which is not afraid to kill the bad guys and not let them walk away. Bryan Mills is, quite simply, one of the best action movie characters of the 21st century. It’s too bad the sequel didn’t do this first one justice. The bonus point is for some amazing fight choreography. There is never a sour note or a false moment in the battles. Neeson is just the man in this role. my original score back in ’09: 5; 9; 6; 4. A final score of 6 out of 10. I did not give this movie its due. ~ by johnlink00 on June 8, 2014. Still stupid and a bit overrated after all of these years, but still fun. Good review John. Thanks. I would have said the same thing before rewatching it. I think it will be remembered well still in a decade.